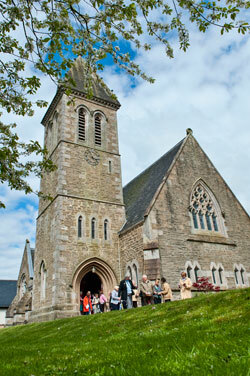 Cardross Parish Church is a community based Church located on the banks of the river Clyde, about 18 miles west of Glasgow between Dumbarton and Helensburgh. We are a small, yet thriving parish church and we interact with, and play a central part, in the life of the community of Cardross. We come together every Sunday morning for worship at 11am except during the school summer holidays when our worship is at 10.30am. Families are particularly welcome and there is activities for children of all ages each Sunday and Messy Church for families once a month on a Saturday morning. We warmly welcome all visitors to our Church and in particular encourage young families to join us to participate in the life of our Church where you will always find a warm and friendly welcome.